24-22 MM beam. I can live with that. This may be the most powerful racquet on the market today. Wow. I’d love to try this frame. I would say it’s out my range in terms of its heftiness but it must be a blast to serve and bash forehands with! It's literally a Beast. I'm demoing the regular 98 beast right now. Really enjoying it. It has plenty of power as it is. The LB version is probably insane. Wait! There is Twaron on this racquet????? @vsbabolat will go crazy with this. Wow. You would have to either be nuts or John Isner to use this thing. For those who think the Blade SW104A swings a little too easy. Wow, similar to a pro’sracquet and it doesn’t cost 269.00. Kudos to Wilson and Prince for providing a smidgen of veracity in a world of constant Pro Stock shenanigans; looks on paper like how a PDT should actually be lol!! Interesting that the racquet appears to have '320' on the top of the hoop but also has a reported 340g strung weight. Damn straight! Wilson were overdue since they had prostocks that had never been released to the public until the UT, but at least they finally did. I like what prince is doing, I just desperately wish they had pallets to change the grip shape and I would use them all the time. And it soughta seems like cheating that someone as tall as Isner uses an XL racquet. People over 6’4” should be limited to 26.5! But extended length doesn’t just help reach higher, it also helps with digging out low balls. Well thats double cheating by tall people. The only advantage short people have is getting down to low balls easier! Tall people should lose an inch of racquet length for every inch they are over six feet; it's okay if they stop at 21" for 6'6" and over people. (Yes I'm 6 feet tall - what of it?) Having said that, they'll need to hold off on that rule until after I buy this racquet, so stock doesn't run out. I’m 6’5” and feel discriminated against. I can’t change who I am. I was born this way! I've had many extended length rackets and I have not found they help with getting to balls, that is what the feet are for and an extra 1/2" isn't much reach. However, I have found the longer ones help me on my serve at 5'10.5" and shrinking. For my ground strokes I found 28" is too long but 27.5 works pretty nice. I'll wait till I can get one of those used. Just wish they would bring back the 28" PCG100LB. My God. Thunderstick this one, I wanna try serving with it! Whoa! This is the highest stock swingweight I have seen on a racquet, like ever. It comes stock with a higher swing weight than Swirly Pure Controls Tour + of yesteryear which were at 350. And the Swirly PCT+ were an absolute animal. I might have to try this even though I don't play with extended sticks. Yeah, I really am thinking about just buying this. I wonder how that swing weight is going to just crush the ball. Gotta love that Prince releases it’s version of a “signature” racquet and charges the same price that they do for their normal lineup and that price is $189. Refreshing in so many ways. While it is not a racquet that I would normally gravitate towards, it would definitely be worth a demo just to see if it worked for me if I were in the market for a new racquet (got a decade or two worth of Prince Tour 98 ESP’s in stock at cut rate closeout prices). 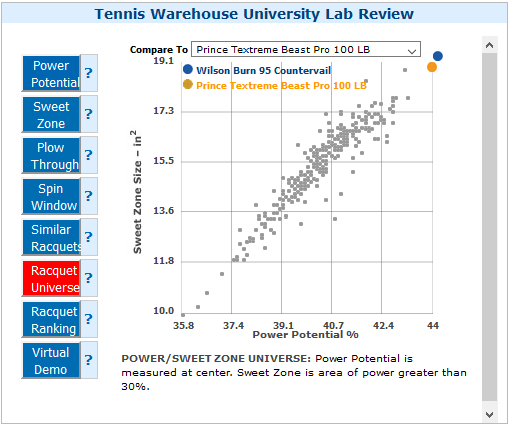 I am hoping that it is a sales success for Prince to the point where some of the other big name companies have to rethink their pricing schedules on their “tour” racquets. Better buy grommets with your frames ! Now if they release a Trawon Premier 110 in the USA I will need 3. What was the SW of the APDGT+ of 2010? I’ve found Prince to be pretty good about QC. If this were Wilson I’d never consider it. Looking forward to hear what you guys think of it once you've swung it...it's definitely appropriately named! Will the racket be available in the UK? As a fan of heavy frames I’m keen to get my hands on it. Are you making the switch Michelle?!?! Yeah Michelle, particularly as you are a Babolat connoisseur of some note, would really appreciate your thoughts on how the 'Bisner' matches up with the various - or any iterations of - the Pure Drive Roddick+s/Tour+s. The PD+ connoisueir is Chris actually Michelle uses the RF97 and her top 3 racquets are RF97, Dunlop Srixon CX2.0 Tour and Yonex SV98+ but still, will be good to hear her feedback. Michelle would no doubt confirm she has played with PD variants extensively; in older reviews - presumably before your time - she often references them for comparative purposes. But thanks for chiming in! Stop being condescending, dude. What do you mean "before my time"? And yeah, I chimed in. This is after all a discussion board. I was just going by what her profile states and most of her reviews suggest she goes for heftier sticks. Mind sharing the reviews here which were presumably before my time? Not that I doubt she has played with Babolats. I just want to see which reviews she references her extensive use of Babolats like you are saying. Also, dont get me wrong. The TW playtesters are awesome and they definitely would have tried everything out there from Babs to Yonex and beyond. But Chris was the only one whose main stick was PD+ for the longest. Correct me if I am wrong please. Is there going to be a video review coming out for this soon? I see there is a video but it's Isner's interview and not the good folk at TW giving their feedback. Would be great to see how you guys feel about it as well. I agree! I think closest one after the Beast might be the Blade SW 104 with swing weight of 341. Check out VCore SV 100+ as well. I have never hit with it but swing weight is right up there with SW104. The Gamma RZR Bubba 137 laughs at swingweights that begin with a 3. I was really hoping to demo the Bisner but was informed by TW that there would be no demos "due to limited supply." Haha, whoa. Yeah forgot about the Bubba. That is just plain crazy. When you note that Chris may be familiar with the PD+ I assume you mean the 300g weight; I actually referenced the Roddick+ and Tour+, as these are far closer to the Bisner spec wise. In any case, Michelle states at 3:06 in the 2018 PD Tour+ video review that she played with the PD+ in college; the 2015 PD Tour+ review lists the PD Roddick as her racquet of choice; in the 2015 PD Tour video review Chris introduces her as a PD Roddick user at 1:34. Please note also that I never questioned Chris PD+ 'connoisueir' [sic.] status, I merely lauded Michelle as a 'Babolat connoisseur (fify) of some note' - you were the one who stated: 'The PD+ connoisueir [sic.] is Chris actually Michelle uses...[ 3x non-babolats listed] but still, will be good to hear her feedback.' This is a clear - and as demonstrated misguided - attempt to undermine her Babs credentials relative to Chris' when she is, in fact, also clearly a long term user. lol dude, I love Michelle!! Haha I would never undermine her Bab credentials. Dont make me sound like a hater here! I told you correct me if I'm wrong! Whoa, that's the full 'L' word; I know she's got an awesome serve an' all, but shouldn't you like date a bit first? YES! If we really want to get into it, and yes, it is relevant here -- I was sponsored by Prince in the juniors and used a Prince Precision Equipe LB (yea...I had no idea what swingweight was back then)! But once I got into college that racquet was discontinued and I spent my summer playtesting racquets and that leads me to the Pure Drive, which holds a very close spot in my heart! I used the Pure Drive Team + in college (2001). After I graduated, I ended up getting a Wilson sponsorship so just asked them for "whatever plays like my Pure Drive"...long story short, once I started coaching college tennis, I switched back to the Pure Drive and played with that when I first started at Tennis Warehouse However, I quickly started geeking out about specs and Chris gave me his PDR and that was actually the first racquet I switched to at TW, and the racquet I was using before I switched to the RF97. Chris did in fact also use the PDR (maybe it was extended too? can't remember), and since has gone lighter and lighter I work out more than he does! Demos will be coming! But probably not for a few weeks (think, early September). We filmed the video this week, should have it up early next week (or possibly today). Definitely would compare it to something like a Pure Drive Tour + or SW Blade 104 or even the SV 98+...it's beefy, in the best way! Not making the switch, but definitely will be playing with it more! Mark tried to take it from my desk the other day and I almost slapped his hand! I really enjoyed it and definitely want to spend more time hitting with it. For me, that higher swingweight really helps in terms of control and then just loads the ball with so much mass! First serves were pretty amazing. I want to go down and turn on playsight and see if I can get some big serves going, I haven't done that in a while so could be fun to see where I can top out. Let me know if I missed anything or if you guys have any other questions!